Posted October 8th, 2012 by LuAnn Bean & filed under Accounting Principles, Advanced Accounting, Cost Accounting, Financial Accounting, Financial Reporting and Analysis, Financial Statement Analysis, IFRS, Intermediate Accounting, International Accounting, Managerial Accounting. Much of our political debate is fueled by the rise in the cost of healthcare, education, and other necessary services. 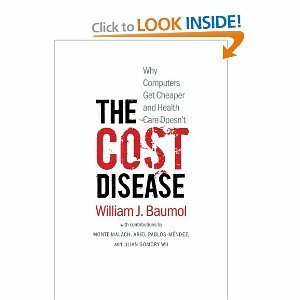 Interestingly, the new book “The Cost Disease” is based on the work of William Baumol, who as a young economist in the 1960s promoted the idea tagged “Baumol’s Disease,” which explains that our current predicament is that “goods” such as medical care and education, public safety or social work suffer from the fact that they are so labor intensive. Together with Princeton colleague William Bowen, the two observed service work and reasoned that no matter how innovative people were in coming up with new technology and new ways of organizing their work, certain services like health care and education would still take a similar amount of time and therefore, outstrip the cost of almost everything else. 1. Explain the title of Steven Perlman’s column “Why cheaper computers lead to higher tuition,” using Baumol’s argument. Discuss whether or not you think Baumol’s Disease has merit in explaining the current economic problems. 2. As Perlman pointed out,”This doesn’t mean that there aren’t things we can and should do to bring down the price of medical care or of a college education.” What is being done in the education realm to enhance or bring down education costs? 3. Refer to Question 2. What is being done in the health care realm to enhance or bring down health care costs? 4. How do you think this concept applies to the Accounting profession?